We have a team ready to help you with your data science readiness assessment. Just fill in the form below and we’ll be happy to work with you to help you achieve your business goals. Building the right data science team for your organization is not as easy as picking the right data scientist. Data science starts by asking the right questions, and the first question to ask is: What is data science? How do they do it? Data scientists use a variety of mathematical tools to help answer questions and uncover patterns that contribute to the results, but it’s not just math… it’s much, much more. 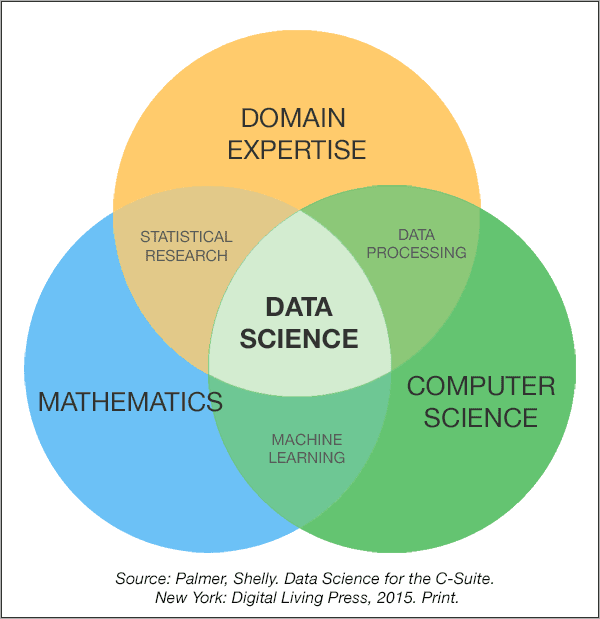 Data science exists at the intersection of these three foundational skills; discounting or overweighting any of them will yield suboptimal results. Can we improve productivity in XYZ Department by increasing the usability of ABC data sets? Can increased access to scanner data, share of basket data, heuristic weather pattern data and parking lot density data increase our return on assets? Can we use our product attributes data sets to improve competitiveness? The more specific your questions are, the more likely you are to get actionable results. 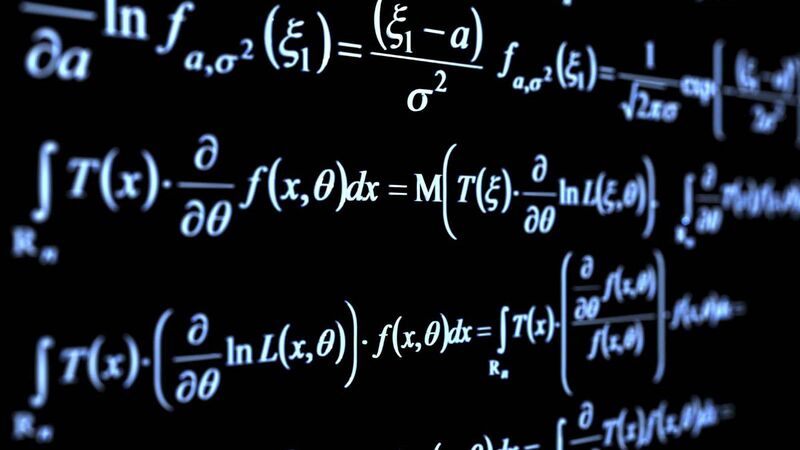 There is a lot of math in data science. The mathematicians on your data science team will be world-class problem solvers. They will be experts in statistical modeling, signal processing, probability models, pattern recognition, predictive analytics and a bunch of subspecialties that you learned in college mathematics class but have long since forgotten. Data science becomes magical when brilliant mathematical constructs are applied to big data sets (vast amounts of data too big for humans to deal with), yielding unexpected actionable insights. The best teams develop AI, pattern-matching and machine-learning tools that generate the building blocks for predictive models. Great mathematicians are a key component to any data science department, but they cannot and do not work alone. Data science happens inside computer systems. It cannot exist anywhere else. Having the right architecture for your data science function is as important as having the right architecture for your physical work environment. Is your current CTO/CIO knowledgeable about the technical requirements for your data science team? Big data requires special storage, special handling and special network capabilities. The tools are different, computer “horsepower” requirements are different – in fact, almost everything you need for your data science team will need to be purpose built, rented, borrowed or partnered with. Formulate Questions: Get your key stakeholders together and formulate context-relevant questions and hypotheses to drive data scientific research. This is an important first step. It will set the stage for success. Audit Data Assets: Assign a team or hire a consulting firm to audit your existing data sets and data-gathering systems. This will help with the creation of appropriate RFPs for potential partners, suppliers and potential acquisition targets. Craft a Roadmap: Build a roadmap to get from where you are to having a working data science department by quantifying the best methods for identifying, obtaining and transforming data sets to make them suitable for the production of statistical evidence. Best-in-class companies realize the importance of analytics. The goal is a data-driven business strategy with an operating model that enables cross-functional collaboration, governance, metrics and change management. You’ll have to create methodologies to empower ongoing data scientific research. You will need to build or buy appropriate infrastructure, including analytics platforms, visualization tools and big data environments. You will find ways to manage data from 3rd-party partnerships, enforce data governance and develop best practices data munging and wrangling. And then, you will be ready for data science.